Centar za razvojnu politiku i saradnju (CRPS) ima zadovoljstvo da vas pozove da se prijavite na konkurs za program “Youth Megaphone: decision-makers of the future” koja će se održati u Mesini, (Sicilija) u Italiji od 13. do 17. februara 2017. godine. Pravo prijavljivanja i učešća imaju svi mladi iz Srbije starosti od 18 do 27 godina. Prijavljivanje se vrši popunjavanjem aplikacione forme (ispod), za više informacija pišite isključivo na mail konkurs@crps.org.rs sa nazivom mail-a “Messina”. Organizator snosi troškove smeštaja i hrane. Učesnicima će biti refundirani putni troškovi u visini do 170 evra. Planirana je dvodnevna poseta Palermu. 22.-30.12.2016 (14:59) – Rok za prijave. 02.- 03.01.2017 – Kontaktiranje odabranih učesnika. 03.-04.01.2017 – Rok za uplatu participacije (u iznosu od € 20) za odabrane učesnike. 12.01.2017 – Predstavljanje programa i potpisivanje ugovora o učešću. This project was born from the fact that nowadays young people are both social actors, who express in a more ambitious and idealistic way concepts related to democratic participation, and, especially that category that, more than others, expresses disaffection for political fields. As a result, the main objective of this project is to build a bridge on the deep gap that separates young people from institutions, making youngsters aware about democratic participation. It is necessary to create a solid foundation for a synergistic, interactive and continued relationship between young people and policy makers. 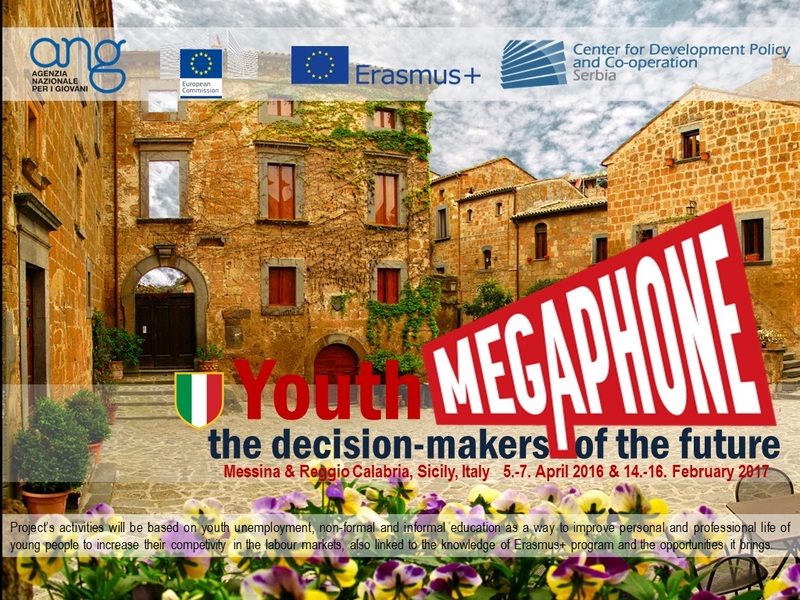 It predicts a preparatory stage during which partners will carry out meetings called “local working group”, and also two transnational meetings to be held in Messina, where will be dealt with the issues of youth employment and education and training. Young people, during the realization of the project, will have the opportunity to experience forms of interaction, both among each other, and with policy makers discussing on issues that affect them personally. Project’s activities will be based on youth unemployment, non-formal and informal education as a way to improve personal and professional life of young people to increase their competivity in the labour markets, also linked to the knowledge of Erasmus+ program and the opportunities it brings. The project lasts 19 months. The partners will organize the local preparatory working groups and the two transnational meetings will be organized together. The transnational meetings will be realized from 5th to 7th February 2016 and from 14th to 16th February 2017, travel days excluded, in Messina (Italy).